The Upbeat Dad! : Rescue in Chile! 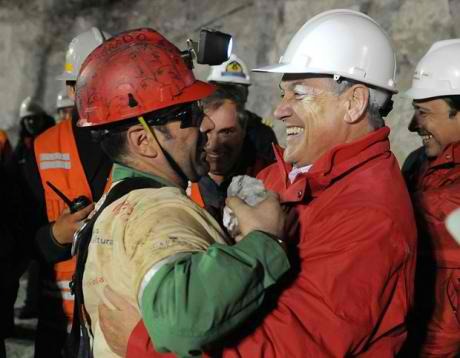 For the better part of the past 24 hours, the eyes of the world have been fixated on a mine in Chile as the dramatic rescue of 33 miners has unfolded. How wonderful that after almost 70 days buried underground, these men made it out to "tell the tale." As they were being rescued, I couldn't help but think of the relief they each must have felt. For the first 17 days, there was no contact between them and their would-be rescuers. Many around the world assumed they had died. But as fate would have it, they were alive - all of them! And now the rescue of these brave men has been broadcast all over the world. As they came to the surface, one by one, I couldn't help but notice a consistent theme. They didn't come up looking for their latest bank statements. Or the value of their investment portfolios. Each of them sought out their families - their spouses and children - and held them as if they were their most prized possessions. I would imagine that as they were stuck underground for over two months, they were forced think of their relationships with their spouses and children. I wonder if they had any regrets. I wonder how many prayers they prayed seeking another chance to show more love to their loved ones. I trust that each of us realizes the importance of the relationships we have with our children. Some of us are married, some divorced, some unmarried, some of us are widowers. But our common bond is that we're dads and that fact alone means we have others to live for. Let the lessons of this unfolding drama in Chile inspire us to bond closer with our loved ones - the ones who mean the most to us. Because when life presents us with challenging circumstances, it is then that we're reminded of what's most important in life.